Gamakatsu's G-Finesse Series Wacky Jig Head is a vast improvement over other wacky jigs. The nickel / titanium weed guard is the first indication that Gamakatsu's raised the bass fishing bar. This weed guard is small but mighty as it effectively clears hazards yet maintains its shape and rigidity under the most demanding use. The jig head is an improvement as well. Better designed to resist snags the hook eye is recessed to prevent getting hung-up in structure. 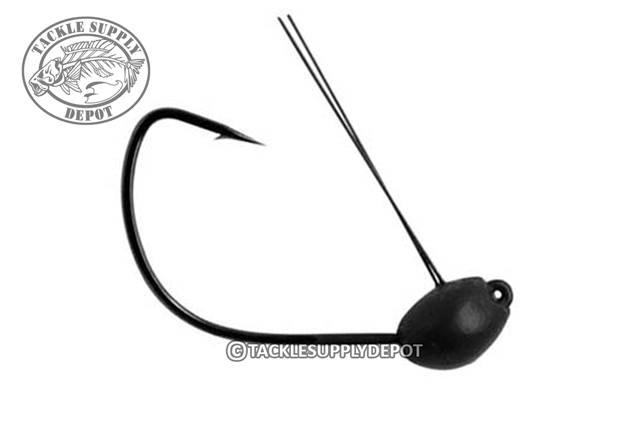 Even the hook is different, a custom addition that's based on a shiner hook but modified for the Jig Head Wacky. The result is a much higher ratio of hook-ups and landed fish than any other comparable brand. When looking for a weighted wacky hook for the popular Flick N Shake finesse approach the G-Finesse Series Wacky Jig Head is hard to beat.